What is a Check Engine Light and Why Did it Come On? You're driving your Subaru around town when you see a small light illuminate on your dash. It could be a picture of an engine, the words "Check Engine", or something similar. You may also see a few other lights pop up, like your cruise control indicator or electronic stability control light. it pays to know what these lights mean so you can make the next right move when they illuminate. When your check engine light, or malfunction indicator light (MIL), comes on, it likely indicates that something is amiss with your emissions or fuel systems. This light is part of your On Board Diagnostic (OBD) system and is basically an emissions tester within your vehicle. It could mean something as simple as a loose gas cap up to a major problem. When your vehicle's computer detects something wrong with a part of the vehicle emissions system, it will turn on the check engine light and store a problem code that the certified technicians at Nate Wade Subaru can use to determine the actual problem. There are two types of codes: component codes, which means that there is a problem with a particular device, its electrical systems, or its controls, and conditional codes, meaning there is a specific condition that has triggered the light. There are many things that could trigger the check engine light on your Subaru, so it is best to determine whether it is a major or minor issue, stop driving if need be, and take your Subaru in to Nate Wade Subaru as soon as possible. First, check to see if your check engine light is flashing or steady. If your light is steady, as most are, then it isn't an emergency but you should still get your Subaru checked as soon as possible by a certified Subaru technician. As soon as you can, check your Subaru for serious problems like very low oil or overheating. Some problems are fixed by simply tightening your gas cap as the light can be triggered by fuel vapors being released. If your light is not flashing and you have determined that none of the above problems are an issue, it is very important that you bring your Subaru top us for a checkup as soon as possible. If the Check Engine light is flashing then you should reduce your speed, reduce your load (stop towing, etc. ), and park your vehicle as soon as possible. You should then have your vehicle towed to the nearest certified Subaru service department. If your check engine light is illuminated, don't wait or you may cause further damage to your vehicle. Even if you don't notice major performance issues, it is still important that you have your vehicle serviced quickly. 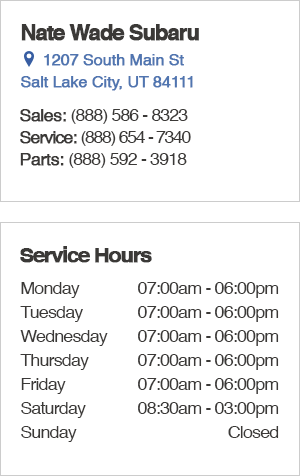 We would be happy to help you here at Nate Wade Subaru. Simply call our Service Center at (888) 654-7340, describe the light and any problems you're having and we will let you know if you should have your Subaru towed to us, or schedule an appointment to bring it in as soon as possible.